The Burns Chronicle is the main literary publication of The Robert Burns World Federation and has been in circulation since 1892. 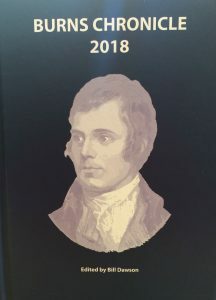 The Chronicle is a unique collection of articles on Burns and Scottish literature and is well considered by academics and literary scholars as well as those passionate about Burns. The literature committee is, at present, working on the digitisation of our entire back catalogue of Burns Chronicles which will build into one of the most comprehensive, searchable resources for Burns study in existence. This will be the portal for this vital tool. The Federation cordially invite individuals, clubs and educational bodies to consider making a donation toward this important resource. Please contact our Office Manager to discuss funding on +44 (0) 1563 572469.